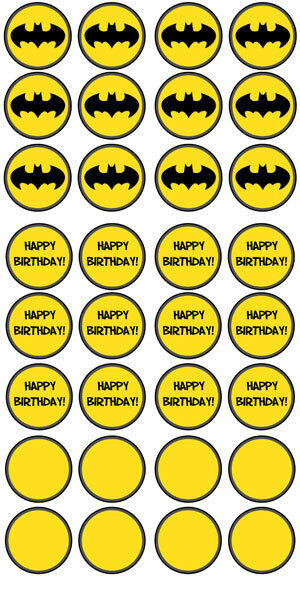 Fun free printable Batman cupcake toppers to make your special little one smile on his special day! This download contains 2-inch circular cupcake toppers decorated with the Batman logo that you can cut out individually or use a scalloped punch. The dark grey and black border of the cupcake toppers match the bright yellow background of the Batman logo. There are also two extra cupcake toppers – a “blank” sheet with where you can edit your own message onto it and a sheet with the message “Happy Birthday” in a fun comic book type font . Note: The Batman logo and trademark is owned by DC Comics. I do not claim to own Batman or its characters. I am just a fan doing some fan art! If you would like to share the Batman cupcake toppers with a friend, please send them directly to this page (Do not link directly to the download file.) so that they can download a copy for themselves.